The month of September is remarkable for astronomy and astrology in that there is both a new moon and solar eclipse on September 1st and a full moon and lunar eclipse on September 16th. Not only that, but there is a second new moon in the month of September falling on the 30th. In addition to all of that, as if it weren’t enough, Mercury is in its retrograde path right now through September 22nd. This article will tell you what all of these astrological events can mean for you in the coming month so read on and know how to prepare. We won’t be able to see the lunar eclipse on September 16th in North and South America, but the rest of the world may be able to. Not to worry, because the moon will be in its new phase, making it difficult to see anyway. The eclipse will also begin during daylight hours for North and South America and after the moon has already set in the East slightly before 8:00am Eastern time, which is another reason why it will not be visible. Although you may not get to see it, the eclipse’s impact can often be felt. This will be a penumbral eclipse which means that the moon is passing through the lighter part of the Earth’s shadow, not the darkest part. As a result, those who will get to see the eclipse will only see a slight fading of the light of the moon’s normal light. 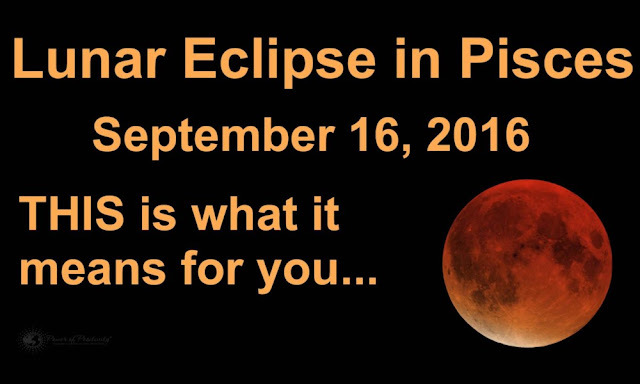 The eclipse will be visible from Europe, Africa, Asia, Australia, and the western Pacific Ocean. Does the eclipse affect human behavior? We believe that it does, but in ways that might not be as noticeable for us as it is for other animals. Most research has focused on the effects of the full moon for humans, which are many, and which happen regularly every month. These can be anything from problems falling asleep during the full moon, to more hospital admissions. The full moon may affect some likelihood of accidents, for people who may be distracted by the full moon and the eclipse as they see it, and also for our pets. In a study of 11,940 cases at the Colorado State University Veterinary Medical Center, researchers found that there was an increased risk of emergency room visits for cats and dogs, 23 percent higher for felines and 28 percent higher for canines on the days surrounding the full moon. Researchers studied primates and their responses to the natural cycles of sunlight and moonlight. They discovered that for monkeys, and likely for other primates, exposure to moonlight is necessary for their normal behavior. The monkeys were observed to stop moving entirely during the dim light of three lunar eclipses. The eclipses fell during a time when the nocturnal animals would normally be highly active. This lunar eclipse falls in the sign of Pisces, which means that for this sign, born February 19th through March 20th, it will have a special significance. Also highly affected by this eclipse will be Gemini, Virgo, and Sagittarius. Wild mood swings affecting many people during this time. You may also notice greater relationship instability. People will be more aware of their public persona and how they are perceived by others during the eclipse. We will be driven to seek attention and we may act out because of this need. We should seek to focus on healing inner issues of self-worth so that the self is valued and is not dependent on the opinions of others. Two stars from the constellation Pegasus are also involved with the full moon lunar eclipse. They will bring good luck to those who are willing to work hard, mental focus and clarity, help for those who are working toward a cause, and both good and bad luck in the form of accidents. Caution is recommended, especially during travel at this time. The moon’s position relative to Venus may bring people’s desire for justice to a boiling point. Seeking revenge to balance the scales for past hurts is not advisable, now or ever. You may be overly attentive to the needs of others, so feel free to reserve some time to focus on yourself instead. Mars in Sagittarius at the time of the eclipse is a good reminder to watch your tongue because you may accidentally hurt others with your sharp words when you didn’t intend to. All of this astrological activity is also happening at a time of Mercury being in retrograde August 30th through September 22nd. Focus on keeping communication lighthearted and positive because you might be pulled into arguments too easily. Prepare for potential delays, frustrations, and lost items. Backup your data often, just to be safe and be extra cautious when planning travel. Keep spending to a minimum and avoid large purchases. The time of mercury retrograde is also a time when you are advised to avoid starting new work or signing any legal documents.